The venerable webinar has become almost as core to most B2B marketing programs as white papers and straight batch-and-send email campaigns. 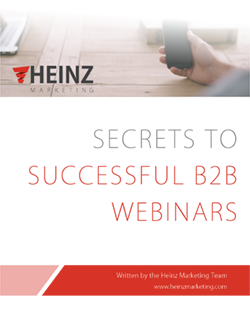 And while some consider is cliché and stale, world-class marketers know that webinars can still be a highly effective and scalable means of driving significant volumes of qualified leads into their sales team’s pipeline. Webinars are often also a mainstay of a company’s content marketing and lead nurturing efforts. Any marketing channel, strategy or tactic can become redundant and stale if you execute like everyone else. We hope this best practice guide helps you invigorate your webinars and drive significant new value to your pipeline and organization.